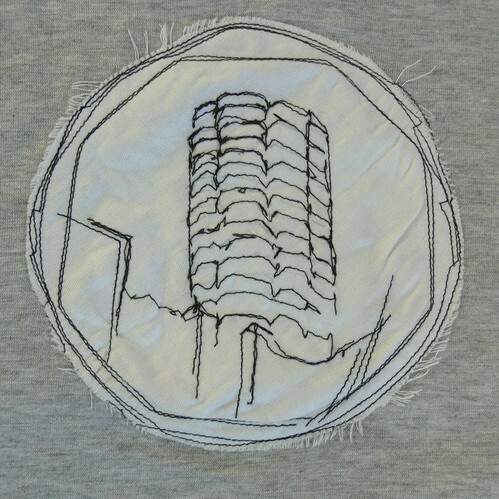 NLA tower t shirt, originally uploaded by Tobyboo. Hey, how cool is this? I love the lines of this piece. It has the rough and ready feel of a blind contour drawing. Plus, it's a building, in stitches. Fab. It is a building in Croydon (London). You can read more about it here, if you're so inclined. Love the rough, raw look of this. I have never had much allegiance to skyscrapers but I love to know about what interests others! Thank you so much!! I find it an eyesore to be honest but knew it would make a good image. Flattered that you've included it!